Anyone who has lived in the Keys long enough knows the power of water to wreak havoc on a building. Even the smallest of damage can develop into disaster if not attended to. Thanks to nearly $3,000 worth of repairs to the Custom House Museum donated last week by the Maryland-based roofing company Ruff Roofers, proper water drainage is now restored to the 126-year-old building stewarded by Key West Art & Historical Society and any further potential damage because of it is prevented. Opened to the public in 1891 as a centerpiece of federal authority in the State of Florida, the Custom House Museum originally housed the Collector of Customs, the Postal Service, Federal Courthouse and the Lighthouse 7th District Office. Today, she stands as the island’s architectural crowning glory and one of the most iconic landmarks of the Florida Keys— but also one that is in continual need of maintenance due to age and the erosive powers of salt and sun. According to Caldwell, a downspout was missing a section while two others had straps that were gone or severely deteriorated and were not securing the downspouts in place. Left as is, the building would have also required masonry repairs in the future. Caldwell’s business, whose niche is historic work, previously replaced two copper acorns and repaired flashings and built-in gutters to the national landmark building and award-winning museum. These repairs insure that visitors to the Custom House Museum will continue to enjoy two floors of exhibitions and programming that weave together two centuries of the history, art, people, and events of Key West and the Florida Keys. For more information about the Custom House Museum, visit KWAHS.ORG, call 305-205-6616 or stop by the 281 Front Street location during museum hours, 9:30-4:30, every day except for Christmas. Your Museums. Your Community. It takes an Island. 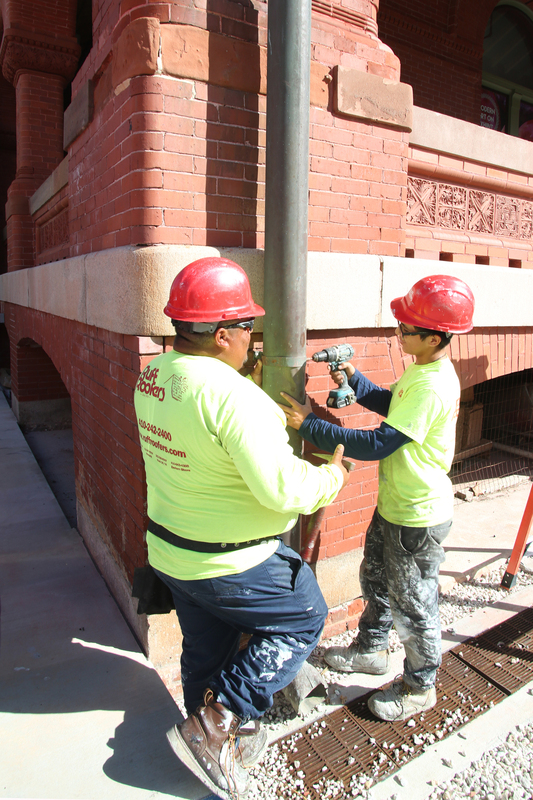 IMAGE: Ruff Roofers foreman Ricardo Sanchez, left, and colleague Arandi Ventura, right, work on repairing a Custom House Museum downspout, a component of $3,000.00 worth of Custom House property repair work recently donated by the Maryland-based roofing company to Key West Art & Historical Society.